So … this is the second recipe that I made last Sunday to eat this week … And let me just say that it didn’t exactly come out the way that I envisioned. Actually, it didn’t really come out like soup at all. My verdict as far as putting it together is that I lack the culinary skill at this time to make soup … Or at least, I lack the culinary skill to make this soup, in any case. 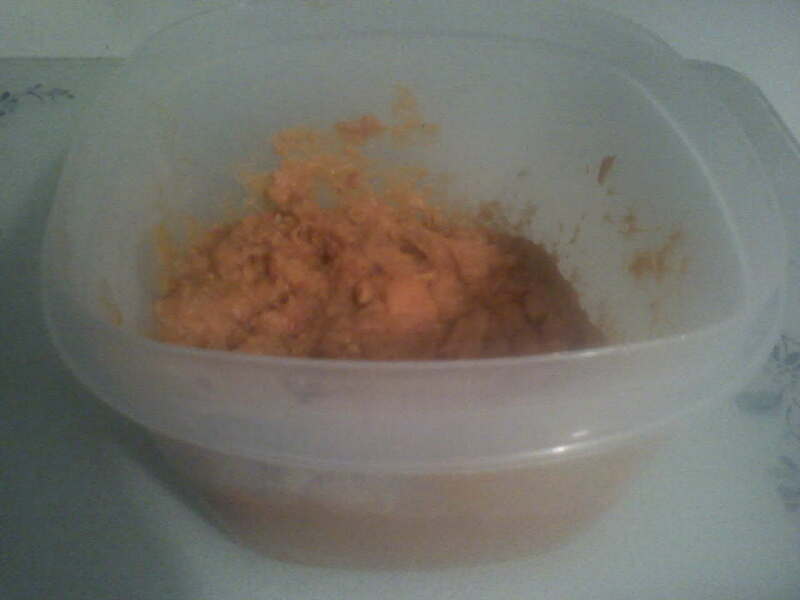 I’m not sure that the above picture looks like much more than some orange goo as far as you’re concerned (again, had no camera, had to use cell phone this week and probably next week) but let me assure you that the texture of this concoction is nothing like soup. It’s a lot more like mashed potatoes. Which is really weird if you’re expecting soup, trust me. This is what it looked like after like, a half an hour of cooking, maybe 45 minutes, when I was starting to get bored. You can see that it is still very obviously cubes of potatoes, mixed in with tomatoes and some other stuff … And at this point I could slice it in half with the wooden spoon – you could hear that crunchy sound that happens when you slice raw vegetables. 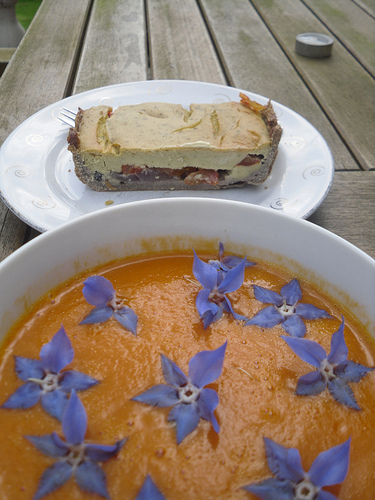 Here it’s pictured from the site with the quiche I made on Sunday as well. However, I’m not knocking the taste – though I don’t think it yielded as much as it was supposed to, I tasted it when it was finished and it definitely was pretty good – it didn’t taste bad by any means. I just apparently have some sort of mental block or lack of capability as far as soup is concerned. Look at how delicious it’s supposed to look – garnished with those little purple Borage flowers; doesn’t it look really good? I thought it did (hence my attempt at making it) but … Mine didn’t look anywhere near as appetizing as that one did. I have like, NO patience when it comes to cooking … I am the one that’s constantly checking like, “is it done yet? Is it done now?” xD Yeah; zero patience. 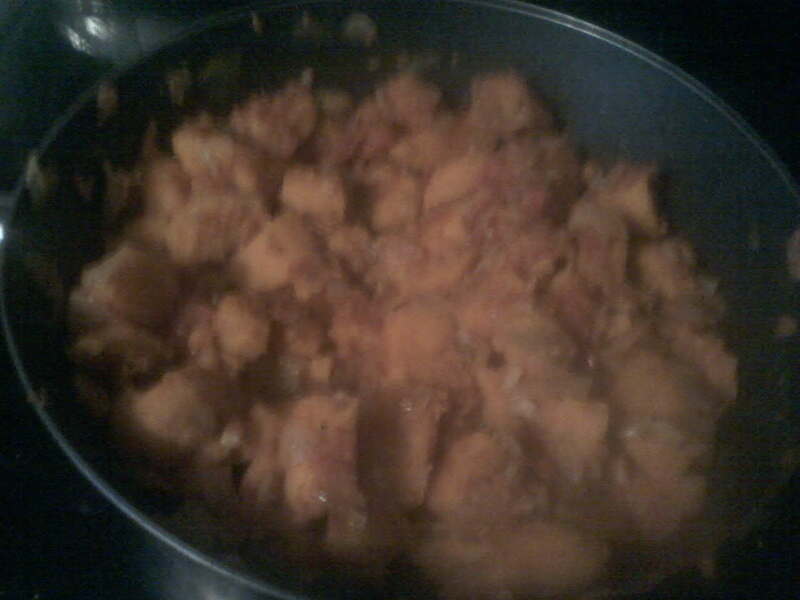 Hm…maybe you could try boiling the sweet potatoes separately until they’re soft, and then adding them? I don’t know about sweet potatoes, but regular potatoes cook much faster if you separate them than if you put them in a soup. I think they just don’t like friends. Or get embarrassed to cook when other vegetables are watching.